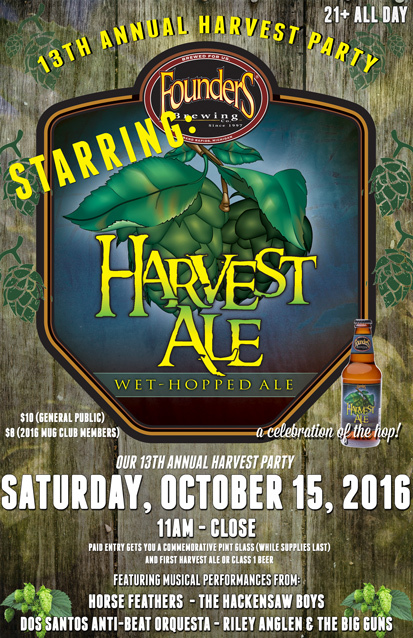 13th Annual Harvest Party - Founders Brewing Co. Harvest Party is one of our absolute favorite parties of the year, celebrating the annual release of Harvest Ale, our award-winning wet-hopped ale! Harvest Party is an all-day, ages 21 and up event in our taproom focusing on our hoppiest offerings. Your paid entry nets you access to the event, a commemorative 2016 Harvest Party pint glass, and a complimentary pint of Harvest Ale or any Class 1 beer. We’ll have live music from 5pm-close, special food offerings, firkins, one-offs, rarities, and some beers brewed just for the event! *There are no advance tickets for Harvest Party, just cover day-of only. Admission is $10 for the General Public, $8 for 2016 Mug Club Members.